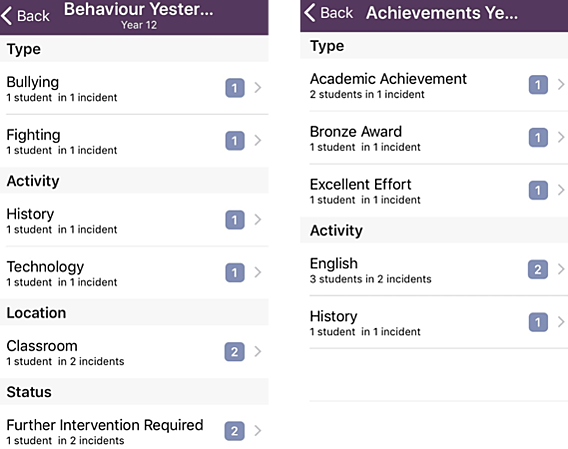 The Reports feature in Emerge Mobile displays a recent collation of information for Attendance, Behaviour and Achievement. From here, you can also see any students at the school that have a birthday today. Tap Reports from your Dashboard (Homepage). Tap on the Attendance reports for the year, today and yesterday. Follow the steps below for instructions on how to use each report. View a breakdown of attendance for all students for the year so far. Groups that you can view are: Everybody, My Groups (if you are linked to groups in the MIS), Year Groups, and Other Groups (all other groups at the school). 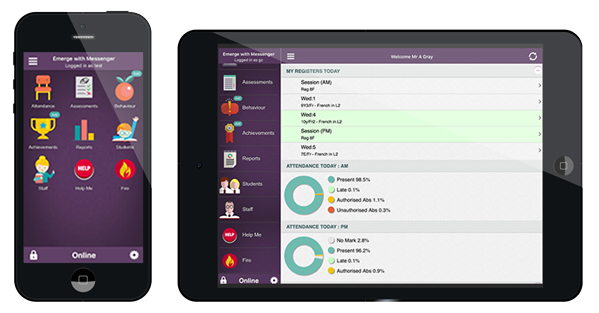 1) Tapping on any of the above groups will display attendance information in the same format. 2) From the top, you will see the the group that you are currently viewing. In the above example, you will see Overall Attendance for Year 7 is being displayed. a. A doughnut chart will breakdown the different attendance marks that have been assigned to students in this group for the year so far. Use the colour key on the right of the chart. b. Toward the lower half of the page, Students in this group will be listed by the percentage that they have been absent during the school year to date. Tap on any list to display all students that have been absent within a certain percentage margins. From the list of Reports, tap on either Attendance today or Attendance yesterday to view a breakdown of attendance marks for today or yesterday. Both reports will appear in the exact same format - by AM and PM Registration sessions. 1) Groups that you can select and view are: Everybody, My Groups (if you are linked to groups), Year Groups, and Other Groups (all other groups at the school). a. You will be presented with a doughnut chart summarising the attendance marks for the AM and PM sessions respectively. A colour key is also provided on the page. b. Tapping on any type of attendance mark (e.g. 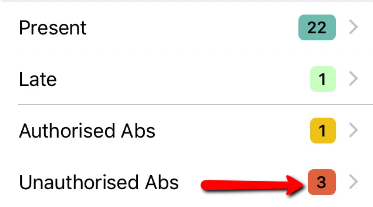 Present, Late, Authorised Abs/ Unauthorised Abs), will show you a list of all the students that were given that mark. You can also use this report to update attendance marks for smaller groups of students (i.e. class groups and registration groups). 1) After selecting a group via the above instructions, tap on any attendance code to view a list of students that were assigned that code yesterday or today (depending on the report you are viewing). 2) Tap Take Attendance from the bottom of the page. 3) Select the session you wish to update. 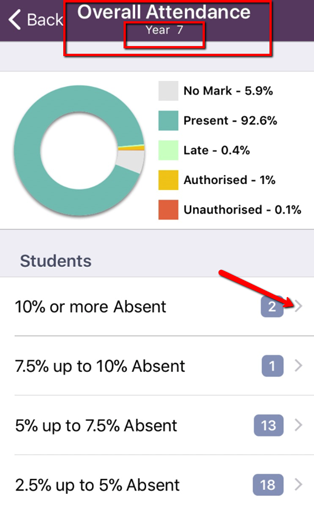 4) Tap on the GREEN side of a student to change their attendance mark to present, or the RED side to confirm their absence. Tap in the middle of a student to pick any other attendance code. 5) Tap Done in the top left corner to save your marks. Tap Reports from your Dashboard Homepage. 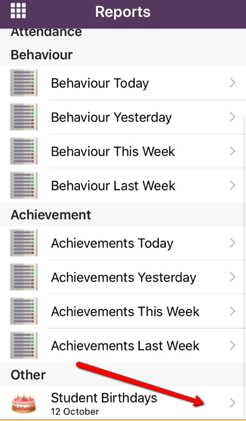 Tap on the Behaviour or Achievement reports for today, yesterday, this week and last week. 1) Select Group. Choose from: Everybody, My Groups (if you are linked to groups in the MIS), Year Group, or Other Groups by tapping on the required group. a. You won’t see all groups at the school, only those where students have been assigned behaviour/achievement points within the time range (today, yesterday, this week, and last week). 2) If you are taking attendance for the AM Registration session, or a timetabled group, follow the below steps. a. Tap on the right (green side) to mark the student as present. 3) You will then see students categorised by Type, Activity, Location (Behaviour only) and Status (Behaviour only). This can be very useful in helping you to spot patterns of behaviour and achievement. 3) Tap on the group you wish to view entries for. 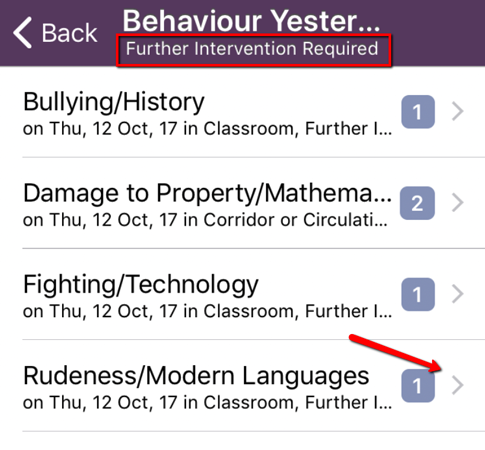 4) From the list of entries, tap to view the details of any individual incident of behaviour or achievement in full. 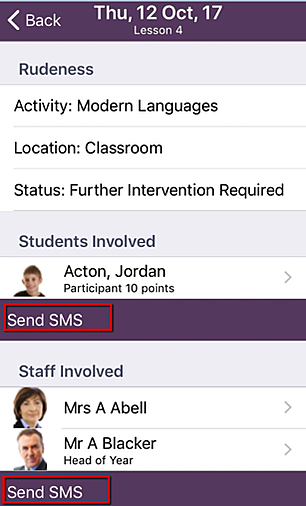 You can also tap Send SMS to send a message to parental contacts or anything other staff that were involved. Scroll to the bottom of the list of Reports and tap Student Birthdays. This feature will display any birthdays for today only. 1) Tap on Student Birthdays. 2) Choose from: Everybody, My Groups (if you are linked to groups in the MIS), Year Group, or Other Groups by tapping on the required group. You won’t see all groups at the school, only those where students have a birthday today. 3) Tap on any group to view students that have a birthday today.